Instead of buying the expensive little packets of coating for chicken or pork, some of which cost as much as $3.00 for a one ounce packet and are mostly salt, save yourself some money and make your own mix. Both of these dry rub mixes can be prepared with basic ingredients in your own spice cupboard, and they taste even better than the store bought brands. For a little extra spice you can even add cayenne pepper to the mix. Mix ingredients and use the same as the store bought package. Recipe will coat 6 - 8 pork chops. You can use this coating on bone-in or boneless chops. Coat pork chops with mixture, pressing the rub onto the meat. Place chops on a lightly greased cooking rack, spray the chops lightly with olive oil and bake uncovered at 375 degrees for about 25-30 minutes, depending on the thickness of the chops. ** During the last 10 minutes of cooking, turn the over to the BROIL settings to finish the chops with a browned and crispy top. ** Use a meat thermometer to check for an internal temperature of 140 degrees, then remove the chops from the oven, cover with foil and let rest for 5 minutes until the internal temperature reaches 145 degrees. Combine all ingredients in a large ziplock bag and shake well. When ready to use, brush chicken pieces with olive oil and place in bag; shake well to coat. Bake chicken pieces at 375 degrees for 35-45 minutes or until juices run clear. Yield: coating for 8 - 10 pieces of chicken. Does the chicken recipe make one package? Ben & Michaila - This recipe will make slightly more than the name brand package, enough for about 8-10 pices of chicken, depending on size. Thanks for visiting! Yes, the TB is for tablespoon. 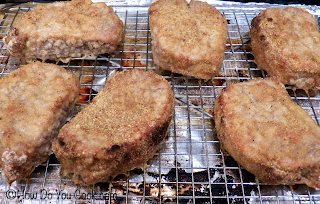 The recipe will coat about 6 - 8 pork chops, depending on size. Thanks for visiting. if i dont have chicken shake n bake, can i use the pork one on my chicken? Yes, it will work just fine. Thanks for visiting. Is TB the same as Tbsp for tablespoon?? Yes, the TB is for tablespoon.